Front: 2.5" lifted coil springs and 0.75" coil spacers, brake line brackets & hardware. Rear: 2.5" lifted coil springs, 0.75" coil spacers, track bar bracket, sway-bar links, brake line brackets & hardware. If running 35s on factory wheels, double check clearance between front tire, lower control arm and sway bar link. • Clears up to 35" tires. • Levels the front with the rear of the Jeep. 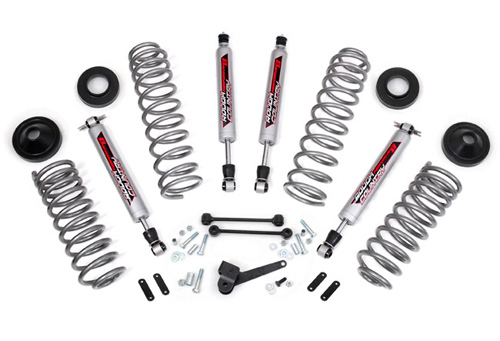 • Unique coil springs for 4-door & 2-door models.